Did you know you can make money just by taking paid online surveys? Paid surveys are all the rage these days, and if you haven’t heard of them by now, you will soon. In fact, there are dozens of sites offering paid online surveys for money. And some are a lot better than others. That’s why our team sat down and studied nearly all the best paid survey sites to find out for ourselves which ones are legit (and high paying), and which ones are not. At the end of this list, I go over many of the most commonly asked questions that new survey takers have, so be sure to read till the end! What kind of survey questions can you expect to answer? 1. Track Record: With so many sketchy sites out there, trust is our number one priority. We are only recommending sites that have been around for years and have a positive track record. 2. Number of Opportunities: If a site is on this list, it means they have plenty of paid surveys available for you to make money from. We don’t want you wasting your time signing up for sites with slim pickings. 3. Income Potential: You deserve to get paid well for your time. The sites on this list are, in our experience, the highest paying survey sites on the internet. We found that it’s smart to sign up with several survey sites so that you are eligible for the most number of paid online surveys — that way you make the most money. Since every site has different surveys (and you won’t qualify for all of them), it’s best to cast your net wide. You may even want to set up a separate “survey site only” email address so you can keep of everything in one inbox. Register here: Free $10 bonus just for signing up. 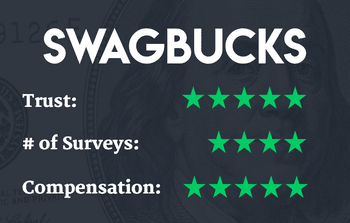 Once we got past the funny sounding name, we were able to see how Swagbucks is one of the most respected companies in the online survey space. In fact, Swagbucks is owned by the same company that runs MyPoints. They have an A+ rating with the Better Business Bureau and have been in business for over 12 years, so you know they’re legit. 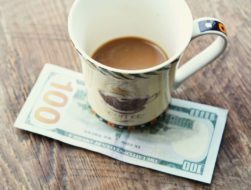 As it turns out, paid surveys are not the only way to make money with Swagbucks (which is why so many people use the site). Use their web search tool (not a search engine, they just want to know what people search for), watch some videos when you are bored, and do a couple paid online surveys each day while you’re enjoying your morning coffee. If you can consistently do that, your cash and rewards will add up quicker than you think. 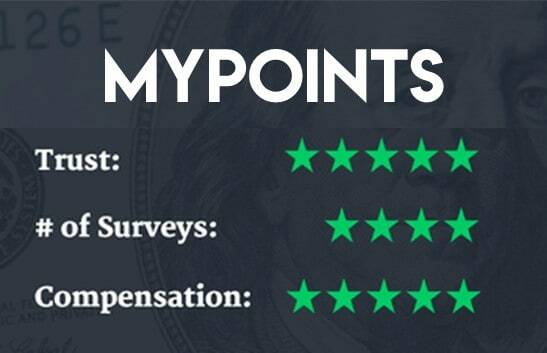 MyPoints is one of the oldest players in the online survey space, which goes a long way towards establishing trust in a sometimes-shady industry. MyPoints has been around since 1996 and has paid out over $236 million to its 10 million members since then. Beyond surveys, Mypoints has several other ways for members to earn rewards, including cash back shopping, watching videos, and playing games. Register for Survey Junkie here. 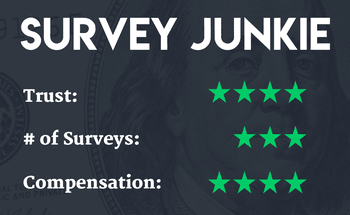 Much like Swagbucks, Survey Junkie works on a points system, and the points can be converted into cash. We found that most of the surveys here were fairly easy, and we were never forced to sign up or buy anything in order to complete a survey. • Create an account (you can sign up with Facebook). • Pick a survey you like and complete it. • Once completed, cash/points will be added to your account. • Do as many paid surveys as you want and can. • Cash out via PayPal when you reach the $10 threshold! “It took some honest hard work, but I had fun doing it. Got my first PayPal payout. 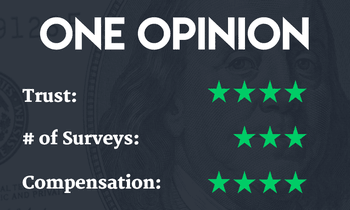 Thank you Survey Junkie for the reward.” -Miles O. Register: Get a $1 signup bonus when you sign up here. Vindale Research another well-established company; it has been around for over 12 years. They’re based out of New York City. One cool feature about Vindale is that there is no points system; everything is cash. You complete the surveys – you get cash – simple and straight forward. But our favorite part about Vindale? The highest-paying paid online surveys are usually more complicated and take longer to complete, but are a great way to make extra money (assuming you meet the demographic criteria). 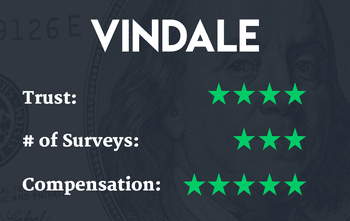 As is becoming more commonplace, paid surveys are not the only way to earn money on Vindale. There are other ways for you to earn money on the site when you are tired of filling out surveys for money. Read our full Vindale Review here. Register here: Free $5 bonus just for signing up. Cash and ease of use. Those are the two biggest perks we found with InboxDollars. After a few minutes of answering questions and watching a couple tutorial videos on how the site works, I had $5 added to my account. Pretty sweet! InboxDollars works on a cash only system, so you don’t have to worry converting points to cash or only being compensated in gift cards. And according to their website, they have paid out over $57 million to users who have completed paid online surveys over the years. After my initial $5 bonus, I found that many of the surveys did not pay out a ton of money, which was a bit of a bummer. Nonetheless, clicking around and answering questions can still net you a couple of bucks an hour, which is better than nothing. You’re going to be on the internet anyway, so you may as well get paid for it! 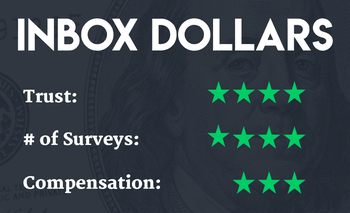 You can read our full InboxDollars Review here. Signing up with OneOpinion is free (you should never have to pay to sign up for any site, ever, FYI) and takes about one minute. The site works on a points system like many other sites. 1,000 points = $1 , and you can cash out once you reach 25,000 points. You can choose to receive your payout either via gift card or Paypal cash transfer. Register for Survey Club here. Since they are a middle man, that means that in most cases, your payout is going to be slightly lower than if you were to just find the surveys yourself. Also, be careful about which email address you use. You will likely be put on a lot of mailing lists by signing up with Survey Club. Nonetheless, having one centralized spot for paid surveys is nice. That’s why we have them listed here as an Honorable Mention. Register for Earning Station here. Earning Station is a very straightforward survey site owned by Massfinity, a well-established company that outsources paid market research. The site works on a points system using “Station Dollars”. You can earn Station Dollars through a many different tasks (not just online surveys). SDs can then be converted into gift cards (Walmart, Amazon, etc) or PayPal cash. The dashboard is really user friendly, which is one of our favorite things about Earning Station. To get started making money on the platform, we simply created a free account and picked what types of activities we wanted to do. 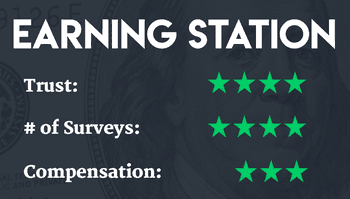 Earning Station has paid online surveys, games, special shopping offers, and other ways you can earn. Register for VIP Voice here. VIP Voice works a little differently than the other paid online survey sites on this list. The points awarded, called “VIP Points”, cannot be converted into gift cards or cash. Instead, members have the chance to enter into sweepstakes (they call it “SweepLand”) and auctions (aka “BidLand”) by earning points. Common prizes are electronics, vacations, cash, and other products and services. 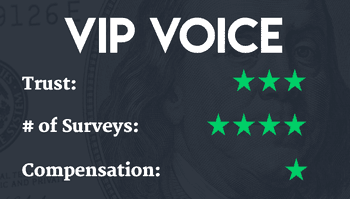 VIP Voice conducts more than 12 million paid online surveys per year. As it turns out, yes. Big brands love using paid surveys to get a glimpse into the minds of average consumers. By going straight to the source (you), companies can improve their products, services, and marketing. Your input is extremely valuable to them, and they are willing to pay a pretty penny for it. When brands want to find out what consumers think about their product and services, they turn to market research companies. Market research companies are the ones actually administering the surveys on behalf of the corporations looking for data/feedback. Think of online surveys as a type of focus group, except in this case, everything is done online. And you still get paid! When it comes to making business decisions, data is really important. That means you can expect all sorts of questions on surveys. Anything that can directly or indirectly help a company fine tune a product or service is fair play. Surveys can be on many different topics, like your TV-watching habits, your favorite places to eat, what material of sweater you prefer in the fall, etc. Many surveys can take less than 5 minutes to complete, although some take longer (and pay more money). An example: Let’s assume Starbucks is conducting a survey for coffee drinkers. • Do you drink coffee? • Do you prefer drinking coffee at home or at a cafe? • Do you have a Starbucks Rewards card? • If so, what new features would you like to see with the Rewards Program? You get the idea. And again, some surveys are longer than others. So why do they pay people to answer surveys? What’s the catch? Because nothing in life is free! Companies understand that, which is why they are happy to pay survey takers like you to take time away from your busy routine to answer questions. Market research company (AKA survey site) pays you. Points – that you can convert into gift cards or prizes. Sweepstakes Entries – using points to enter into cash and prize giveaways. Ah, the big question on everyone’s mind. So here’s the deal. You will not get rich taking online surveys. I repeat, you will not get rich taking online surveys. • Are you consistently taking them? • Are you able to qualify for higher paying surveys? With that being said, most surveys take less than 10-15 minutes and pay between $0.50 and $5, although I’ve heard of some surveys paying up to $200 (these are rare). If you can do that, I think it’s reasonable to make several hundred extra dollars per year. To make much more than that would require a serious time investment from you, at which point you might want to consider finding better uses of your time (like a part time job). Something to be aware of: qualifying for surveys. They answer a few questions and then come to find out that they don’t qualify for the survey (and won’t get paid). A lot of people take this the wrong way and feel like they’re being scammed, which is just not true! Unfortunately, a lot of people think that because they didn’t qualify for a survey, the company conducting it is somehow scamming them. Remember, companies want to gather data and feedback from their target customers. Remember the Starbucks example above? Well, if you are not a coffee drinker, it makes sense that Starbucks doesn’t want to spend money on giving you a survey on something that doesn’t apply to you! That’s also part of the reason why almost every survey site asks you basic questions when you create your profile– so they can match you up with surveys that you are most likely to qualify for. But sometimes there are small criteria you won’t meet for a specific survey, which is where the screening questions come into play. Sadly, not every survey site out there is legit. Some are scams. It’s sad because these fake sites give the very legitimate survey industry a bad rap. Since taking surveys to make money in your spare time sounds like such a great gig, there’s always going to be someone out there trying to take advantage of people excited for the opportunity. They charge you a fee to join their network. Promises that you will make thousands of dollars each month. They request your credit card numbers or social security numbers. If you come across a site doing any of the above, stay away. You’re best off focusing on the survey sites in this article. 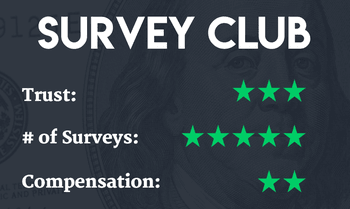 To start making money today, stick with our list of the best paid survey sites. There are a lot of options out there for taking paid online surveys to make money. Don’t let yourself get overwhelmed! Start with the sites listed in this article. They’ve all been vetted to make sure you won’t be wasting your time by signing up. Are the surveys for real? I want to try them but do not want to waste my time. Josie, yes, they are real. You won’t get rich from them, but you can make a few bucks. Great research my friend. Your article was well put together. Getting paid to do something you love like surveys is always a nice feeling. Look forward to reading more of your work. I can vouch for some survey sites, they repay me with gift cards. Another good site is Rewards1 for surveys. Nice list you have there. I have tosay that by joining the survey sites that you haveon your list i have madeover 300.00in the last 6 months doing surveys and watching videos so if you have the timetospend doingsurveys you wont makea whole lot of money but you will enjoy the survey opportunititys and every little bit will add up if you join all of these except panda research which is known for sending your money to someone elsed paypal account because it happened to me about 2 years ago andthey took 186.00 from me. Thank You for your hard work on the research. I am newly retired and will try this for supplementing my income. So happy I found this article. Good luck on your career path as well. ? Thank you very much for your explanation . This is very use full for new comers. Good luck and please continue your sharing information. Thank you so much for the information. 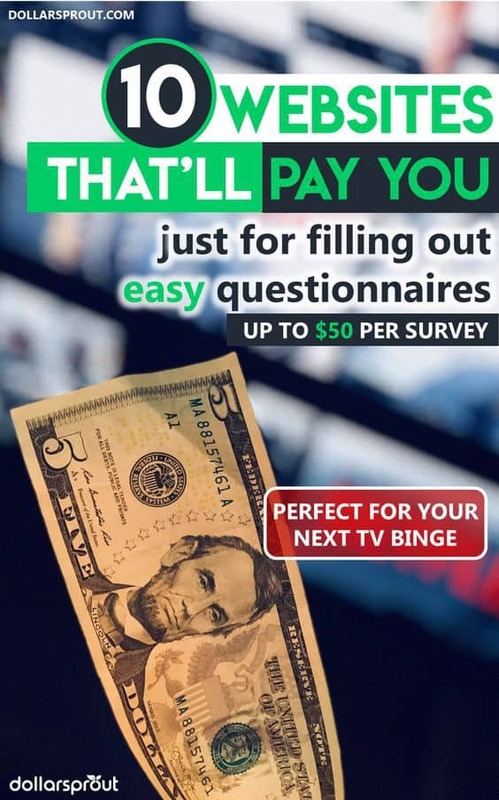 My girlfriend called me today and told me she’s been taking surveys and they have been sending her 5, 10 even $20 cash for each survey that she returned to them so now of course I’m interested but I wanted to see what my options were and you helped a lot by listing your top checked surveys. Thank you! Do you know which survey sites allow non-US residents? I’m not in the US and cannot take Vindale surveys for example. Thanks! A little late getting into this discussion. But my favorite so far is OneOpinion. I think it’s mentioned here. Survey Junkie cool. MyPoints is okay. Ipso, not so much. I did make 300 points today in about 6 hours and every single survey except one I was disqualified for. I was disqualified for the two pointers as well as the higher pointed ones. I’ve never had that problem. Yes you get disqualified, but not everyone out of 30 or so. One of them I actually made to the 98% and was disqualified. I think they didn’t like the fact I was female, except that was answered at the beginning. Being abroad, which survey companies do you recommend? Found another good site called Ebuno. Haven’t withdrawn anything yet but looks promising. I assume I’m not allowed to share any referral link but the direct website URL is https://ebuno.net. Any thoughts on Panda Research? I don’t want to say anything negative until I get feedback. Well, I signed up for Panda research and did a few surveys and all was fine until the other day they had an offer for investing with bitcoin, Just so you know it was listed as a survey. I watched the video which seemed very appealing so I did a google search on bit coin and the person(Steve Banks) that was selling the product, 1) because my malware kept coming up saying fraud and 2) it was too good to be true. Anyway after my search I found out that there was no such thing as bit coin advertising and that the company (Bit Coin Millionaire Club)had scammed people out of thousands of dollars and is listed on the BBB’s website as a scam. I then sent Panda Research an email making them aware of what I found out and advised them that they should not offer it as a survey because it is a scam. Long story short they never responded back and they still have it up on there site. Just be very careful when signing up with Panda Research there is almost always a fee attached to there surveys and even when you do fill them out your money is in pending mode.